When you install WSL, this is the terminal you're stuck with. Better terminal experience right out of the box! You can also install other terminals such as Tilix or good old XTerm. You can of course add more Linux GUI apps! 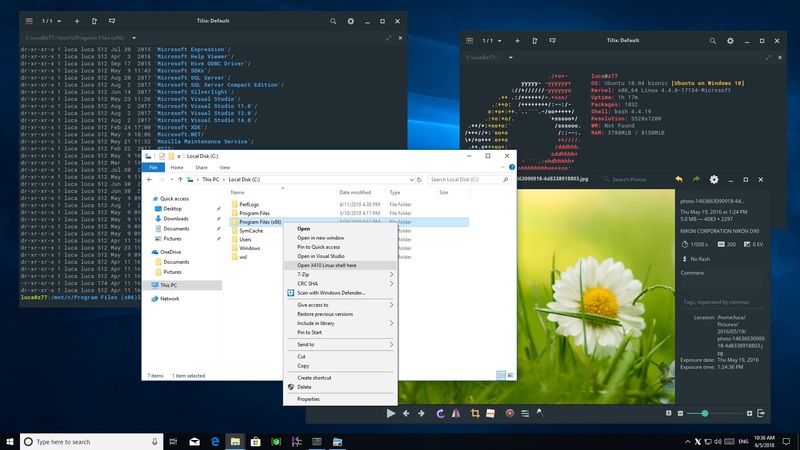 Looking for a hassle free way to run Linux GUI apps from Windows Subsystem for Linux (WSL)? Try X410, the ultimate X Server for Windows 10! You can simply search for X410 from Microsoft Store and install it right away. No longer need X410? Just click "Uninstall" from the right-click popup menu for X410 on Start screen. 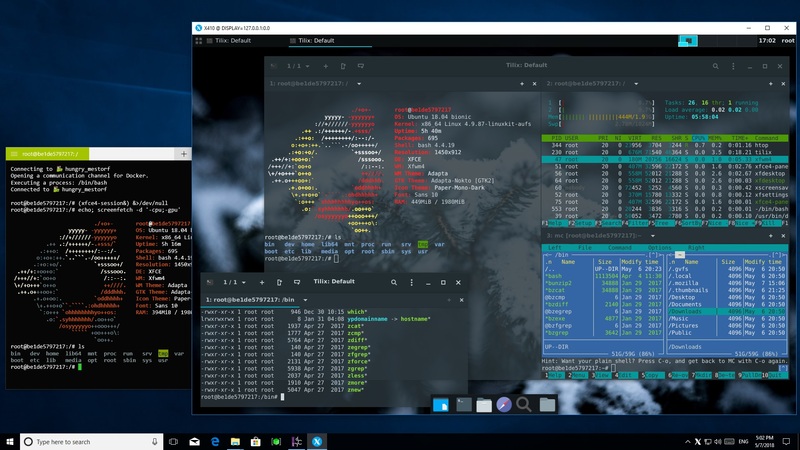 Once X410 is installed and running, you just need to set the DISPLAY environment variable to 127.0.0.1:0.0 in WSL for opening your favorite Linux GUI apps on Windows 10! 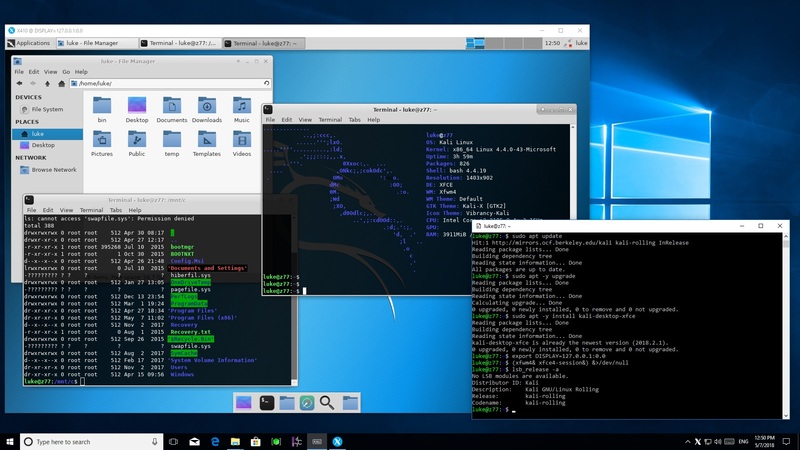 Please note that WSL doesn't officially support running Linux GUI apps for X Window System. Hence you may see far more warning messages than other platforms or even unable to run some Linux GUI apps in WSL. X410 is published via Microsoft Store after it's certified by Microsoft for compatibility and content. It's also digitally signed when it's delivered to your Windows 10. Thus you have fewer things to worry about X410 when it comes to malicious codes and viruses. Since X410 is a genuine Microsoft Store app, Microsoft Store will also automatically keep it up to date whenever a new version is available. X410 utilizes the source codes from the X.Org open-source project. However, unlike other products from different companies, we've removed the dependencies on Cygwin libraries and streamlined the codes. Using HiDPI screens? X410 doesn't just enlarge pixels and show blurry output; it accesses the raw pixels on HiDPI screens. You'll get small GUI controls and windows if you use the default X server settings. But, since modern Linux GUI apps natively support scaling in toolkit level, you can get crisply scaled apps with X410 just by enabling that feature. X410 behaves like an app rather than a full blown graphical display server; it runs snappier and consumes less system resources. We'll be focusing on improving and optimizing X410 to work more seamlessly with Windows 10. X410 has two seamless integration modes; Windowed Apps and Desktop. If you want to use your Linux GUI apps individually side by side with normal Windows apps, choose the Windowed Apps mode. In this mode, X410 activates its own window manager for Linux GUI apps that enables you to position and resize the apps along with Windows apps. If you want to experience more immersive and comprehensive Linux GUI desktop environment such as Xfce4, choose the Desktop mode. Do you want to open Linux GUI apps from the Docker Console in Token2Shell? Just run X410 and you're ready! You don't need to change any setting, simply install your favorite GUI apps and use them as if you're on a Linux machine. X410 also works flawlessly over SSH connections with X11 forwarding. Do you want this in WSL? No problem!